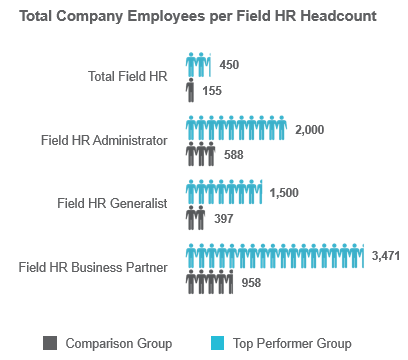 ScottMadden»Insights Library»Article»Top-Performing HR Shared Services Organizations: What Makes Them the Best? Benchmarking results from this study indicate four keys to being a top-performing HRSS organization. Reporting to an HR executive. Seventy-eight percent of top-performing organizations indicate reporting to an HR executive within their HRSS organization. Our experience shows that this approach provides the most direct and simple governance model for HRSS organizations. Tiered service center. A significant performance gap occurs between those with tiers and those without tiers relative to total service center staffing. Additionally, among those using tiers, top-performing HRSS organizations show better Tier 1 staffing than other organizations. Hybrid COE alignment. Lower COE staffing levels are observed in top-performing HRSS organizations, and they are more likely to leverage hybrid COE models consisting of a mix of centralized and distributed resources for “field-focused” groups. Shifting administrative work allows for field staffing efficiencies. Field HR often represents a big opportunity for reducing or shifting transactional and administrative work. In comparison to a leading practice model, typical HR field resources spend significantly more time performing transactional activities. Shifting the bulk of administrative work to a service center enables top performers’ field HR to operate more efficiently and to focus more on strategic initiatives. Leveraging Tier 2 enables less field HR staff. In addition, setting up a tiered service center enables HR to shift both common and specialized administrative work from the field. For organizations with robust use of Tier 2 specialists, top performers are able to operate with about four times less field HR staff. Correct portal set-up drives volume. Establishing employee portals with personalized content and system integration results in significantly greater portal usage. More than 75% of top-performing HRSS organizations participating in the survey indicated using robust employee portals, which correlates to higher portal use. Higher self-service use leads to more efficient staffing. Manager and employee self-service allows organizations to staff their COEs and service centers more efficiently. Among top-performing organizations, staffing levels in HR service centers with high self-service transaction volume is about half that of those with lower self-service use. lower turnover. Higher satisfaction rates exist among the top-performer group and organizations that have higher customer satisfaction are able to operate with lower staffing levels. Lower turnover allows the staff to build competence and be more efficient. Better performance drives better satisfaction. Higher customer satisfaction scores are aligned with better performance on customer service metrics, such as average speed to answer and first contact resolution. Top performers did not just land on the list by happenstance. They are pursuing excellence in human resources as a long-term and calculated race. The goal? It is indeed all about setting up the HRSS organization to contribute as a value-added partner to the business. The time is now to improve by leveraging the top-performer characteristics to accelerate your success. Contact us to learn more.